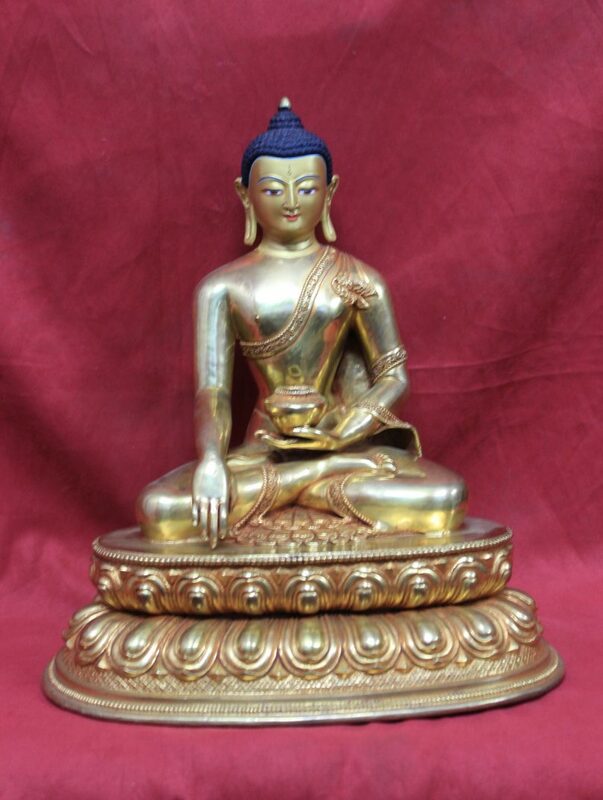 Size is 30x27x18 cm tall. The body is placed on lotus base. The statue is beautifully carved and Fully gold plated body. 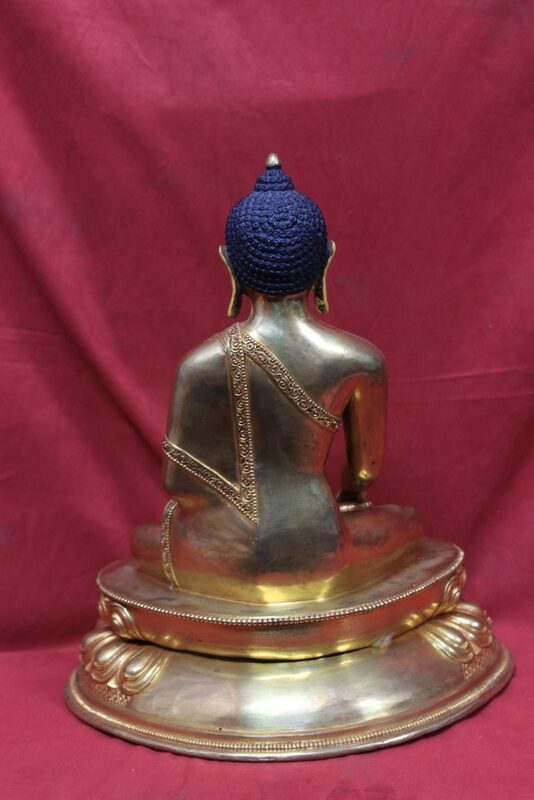 It is carefully hand painted with 24k gold. This is Fully gold plated Buddha Shakyamuni statue online designed to place in home, garden,monasteries, Temples, dharma centers and even in places like Yoga Centers and Hotels for decoration. 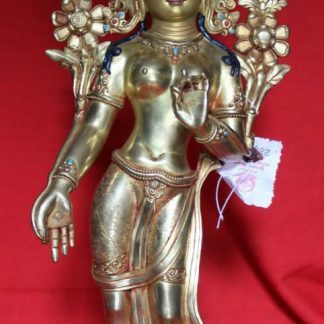 The statue is elegant and is with Fully gold plated body. Face is carefully hand painted with 24k gold. 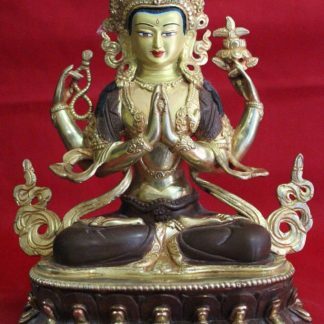 Shakyamuni Buddha is positioned in bhumisparsa mudra with finger touching the earth. 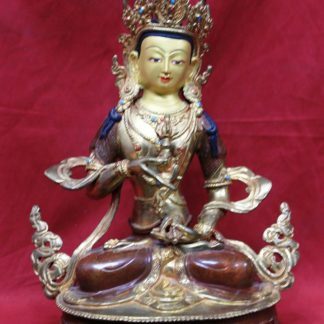 Core body is made of Copper using traditional ‘lost wax method’ for casting. 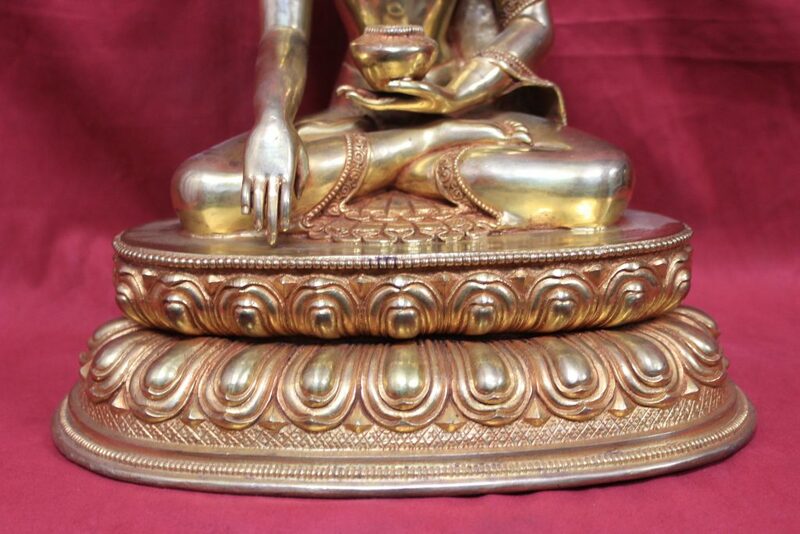 Carvings on the body and face are all done by hand by Newar Artisans of Nepal. 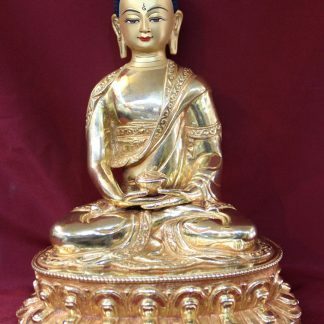 If you need the statue can be blessed by a Buddhist monk here in local Tibetan Monastery here in Nepal. Please contact us for more details. 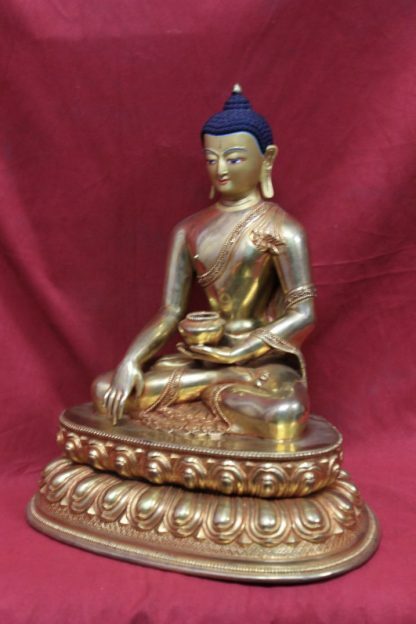 Symbolic Meaning: Shakyamuni Buddha was born in Kapilvastu District, Lumbini Zone (Nepal) in between 563 and 483 BC. 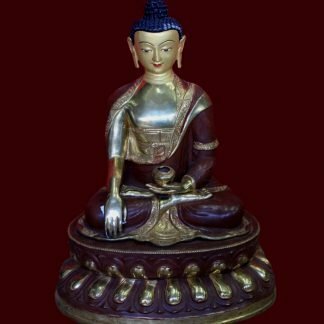 He was born in a shakya clan to father King Suddhodana and Queen Mahamaya the mother.Click Here for more: Shakyamuni Buddha? What does it mean? 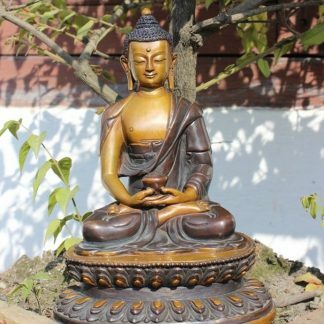 Buddha statues are created with number of materials.You’ll find different statues made from various materials like Copper, Bronze, Brass, silver, wooden, resin, very statues etc. They can also come in full or partial gold plating. 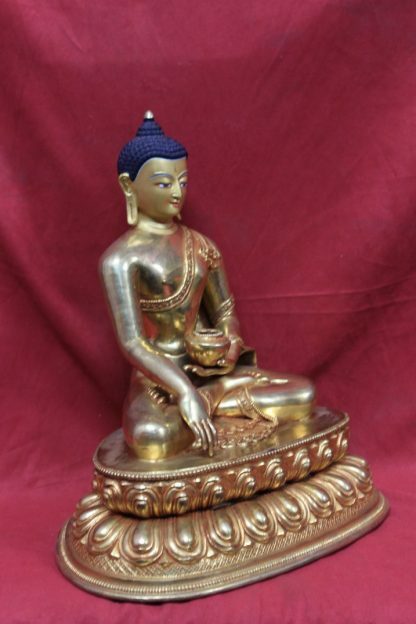 Or if you like antique or antique reproduction statues are also available.If you need some more guidance Do check here on buying right Buddha statues. 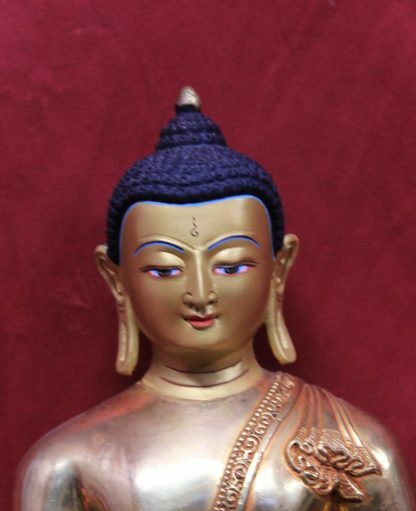 If you are interested in wholesale or bulk purchase contact us here.